Første reelle alternativ til 250W MSD movinghead!! 35% kraftigere end Phantom MSD250W modellen! Efterfølgeren til den populære Phantom 50. Markedets kraftigste LED movinghead i denne størrelse. Phantom 75 LED er utrolig kompakt og giver lys- udbytte og funktioner, der er meget attraktive for prisen - og til en kvalitet, der ikke findes bedre. Lyskilden består af 1 stk. 75W's LED diode og den har en levetid på minimum 50.000 timer. The Phantom 75 LED spot is a medium size powerful moving head with a 75W white LED light-source. It is very complete with 7 Gobo's, 8 dichroic filters and lots of extra functionalities like gobo-shake, gobo-rotate, prism, split & rainbow colors. Because of the LED source the shutter is electronic not mechanical. Focus is motorized and it has a mechanical zoom. You can choose between a 8 or a 14 DMX channel personality. If you like to operate without controller you can use the 16 built-in programs which can run automatically, sound-active or in master/slave mode. 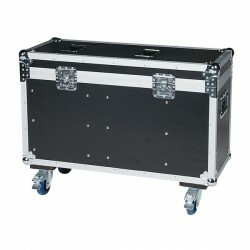 The stylish design and lightweight housing make this moving head very attractive and ergonomic. The gobos can be changed very easily by a handy lid. Check the online product video for more details.